Our cells are continually being replaced, but this renewal deteriorates with age. The result is that the body's organs and tissues become less vital, and signs of ageing are experienced physically and mentally. Apana Balance supports cellular regeneration, which slows biological and psychological ageing. Benefits accumulate over time. To help rebuild the body, and restore that youthful glow, Apana Balance includes Shilajit, famous in Ayurveda for its rejuvenative properties. Another major ingredient is Guggul, which helps balance total cholesterol. Preliminary research suggests that Guggul may also help fight tumours. 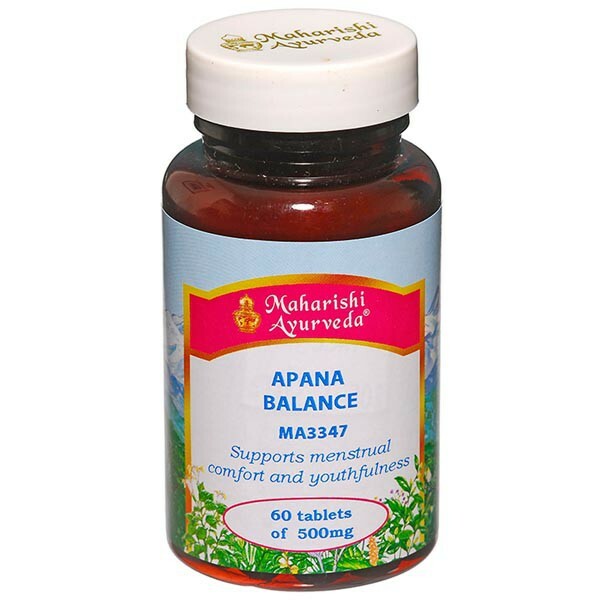 Apana Balance is especially helpful for women during the years before menopause. 60 tablets; 30g - 30 days supply. 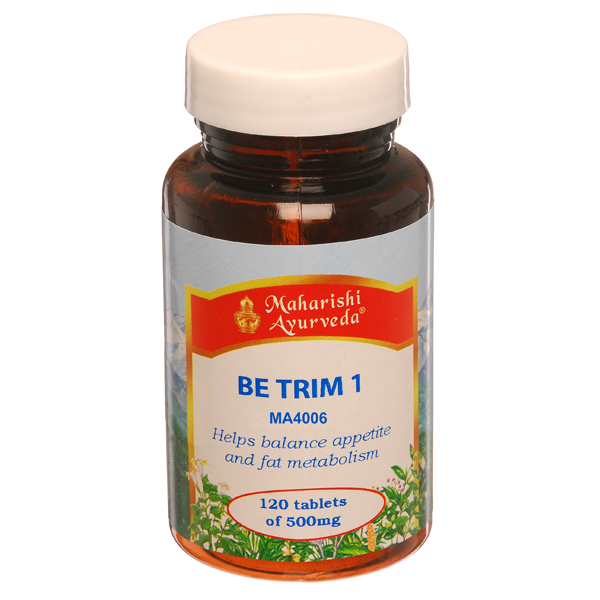 Be Trim 1 food supplement is recommended for those who have a slow metabolism and tend to put on weight easily even when food intake is not great (kapha dosha/body type). It supports the fat metabolising process (medoagni), helps curb the appetite and slows the absorption of carbohydrates. Be Trim 1 also helps improve liver function (ranjaka pitta), assists in the production of pure nutritional fluid (rasa agni) and blood (rakta agni). It also assists in the digestion, the movement (samana vata), and breakdown (pachaka pitta) of food. 60g - 120 tablets, 60-20 days supply. 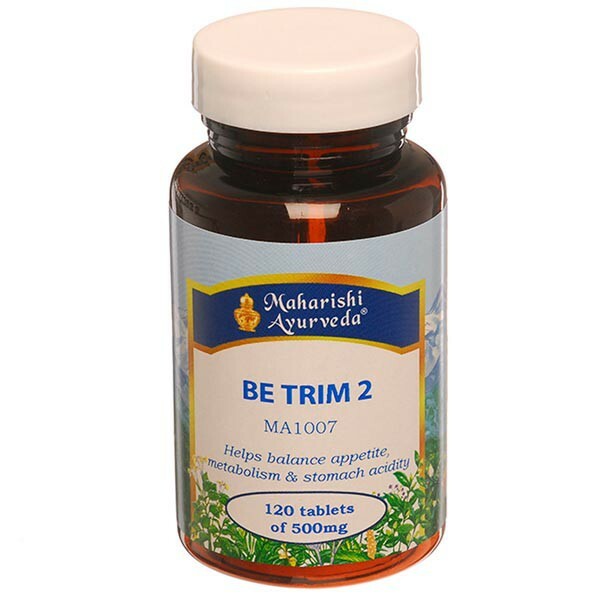 Be Trim 2 food supplement is recommended for those who have a strong appetite even after eating and a tendency to produce excess stomach acid (pitta dosha/body type). This supplement helps moderate the appetite, balance the regulation of stomach acidity and enliven fat metabolism. 60g tablets, 30-10 days supply. Even eating wholesome, natural food does not assure good nutrition. Poor digestion renders even the healthier diet ineffective. The body has to able to absorb the nutrients before it can use them to create health. Maharishi AyurVeda Digest products help improve digestion at every step, from good appetite to improved health. 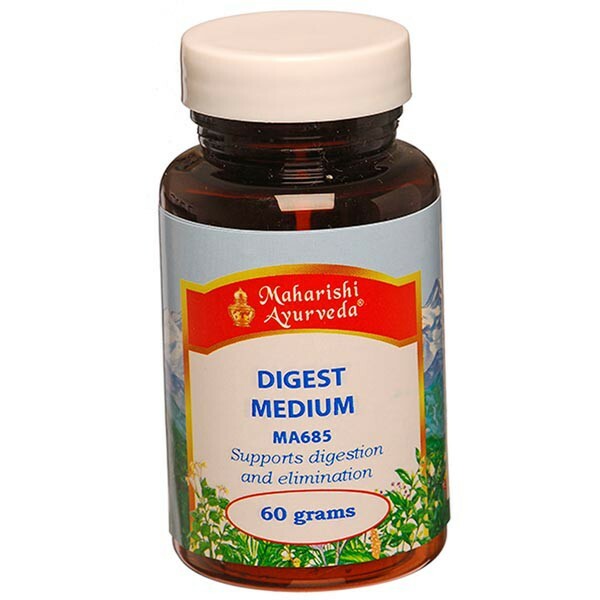 Digest Medium powder supports digestion and elimination. Even eating wholesome, natural food does not assure good nutrition. Poor digestion renders even the healthier diet ineffective. The body has to able to absorb the nutrients before it can use them to create health. 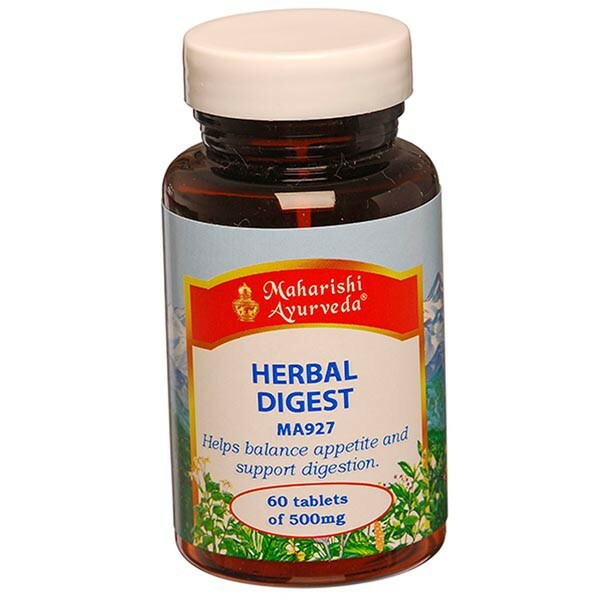 Maharishi AyurVeda Digest products help improve digestion at every step, from good appetite to improved health. 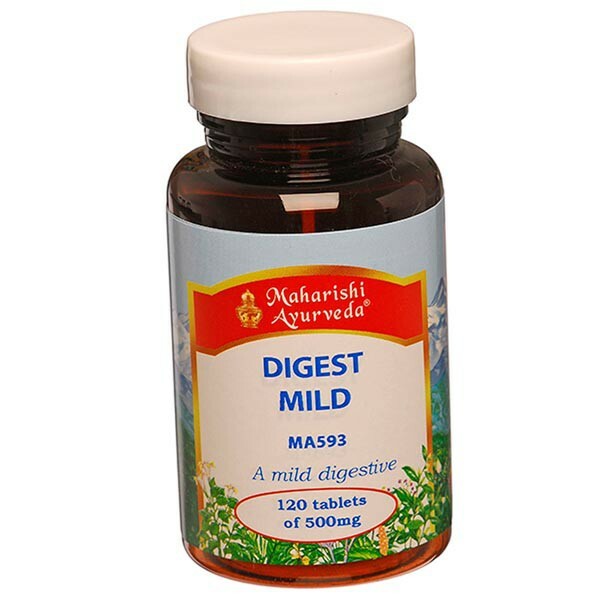 Digest Mild tablets supports appetite, digestion and balances digestive gas. Agni, or digestive power, is seen by Ayurveda as central to good health. Poor digestion means lack of full nutrition and the accumulation of ama, undigested food that forms toxic waste in the body. Sluggish bowels, feeling dull, tired, or bloated after eating, or feeling that your digestion is low, are signs of a weak Agni. Digest Plus regulates Agni to balance your appetite and support good digestion. It helps balance stomach acid, reduces gas and supports liver and pancreatic function. It also detoxes ama from your body tissues. This preparation is especially suitable after a heavy meal. Pitta dosha is the fire element in your body and responsible for digestion and metabolism. Too many hot, spicy foods result in an over-accumulation of Pitta in your digestive tract and excess stomach acid. This lack of balance in our digestion leads to short-term discomfort and can eventually lead to more deep-seated health problems. The 17 herbs in Gastro Support work synergistically to help maintain balance in the stomach and digestive tract. The cleansing and balancing actions of this preparation normalise stomach acids, bring back a feeling of digestive comfort and ensure we get the maximum nutrition from our food. Too many sweet, heavy foods, long-term stress and lack of exercise can contribute to an imbalance in sugar metabolism. 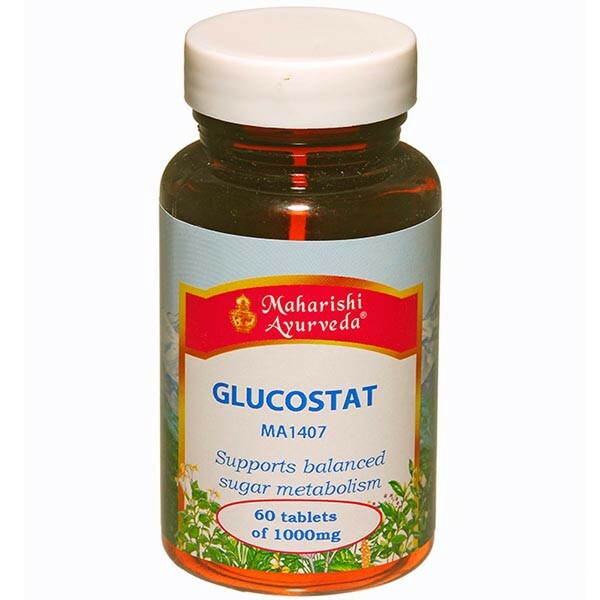 The Glucostat herbal formula is a powerful combination of herbs that supports the body's natural ability to metabolise sugar. Glucostat also helps keep the nerve cells in the leg healthy and flush out impurities. Helps support normal functions that can be strained by poor sugar metabolism. This product has been replaced by MA471 Java Plum/Bael complex. 60 tablets - 60g, 30-15 days supply. Pitta Dosha combines the elements of fire and water and governs heat, metabolism and transformation in mind and body. Foods that increase Pitta, such as hot, spicy and acidic foods, can bring it out of balance. Stress and pressure at work can also contribute. One of the early symptoms can be over-acidity in the stomach. If left unchecked, this can knock digestion out of balance and lead to a variety of health problems. 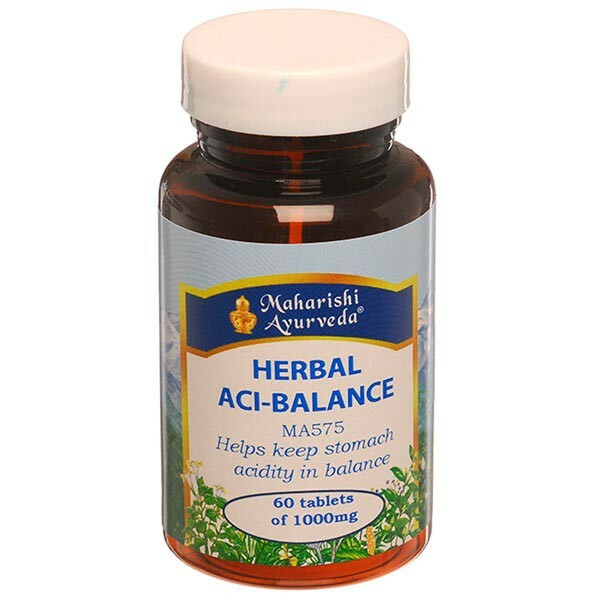 The 17 herbs in Herbal Aci-Balance are soothing and cooling to the stomach. They help nip Pitta imbalances in the bud by keep stomach acidity in balance.